Every year a number of festivals take place in Armenia during which the visitors have the opportunity to get to know about the Armenian culture, customs and traditions, rituals, delicious cuisine, traditional clothing, etc. 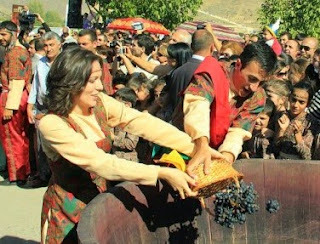 One of the best known festivals in Armenia is 'Areni Wine Festival' which takes place in Areni village. It is a well-known fact that the Armenians are famous for their wine production and the tradition of wine-making has been preserved since ancient times. As we know when Noah's ark rested on the Biblical Mount Ararat, Noah started to cultivate grapes on the slope of this mount. From then on the grape cultivation and hence wine-producing became a tradition in the Ararat valley. During 'Areni Wine Festival' wine-producing factories as well as individual producers present their wine and one has the opportunity to taste wines and choose the best one according to their taste. During this festival a number of events are organized: wine-making and tasting, food-making and tasting, singing and dancing, as well as various games and competitions. During this festival several contests are organized, such as 'Armenia in your eyes' best wine label contest; 'Gold Keg' prize for the best wine among the best wine-producers; Homemade wine-producers contest; 'The best souvenir of the festival'. Another festival which is worth taking part in is the 'Golden Apricot Yerevan International Film Festival' which is held annually in Yerevan. During this festival new works by Armenian film directors and producers as well as foreign cinematographers of Armenian origin are presented the theme of which is Crossroads of Cultures and Civilizations. It promotes creativity and originality in the area of cinema and video art. The major awards at this festival are the Golden Apricot and Silver Apricot prizes for feature, documentary and Armenian panorama films. The main theatre festival in Armenia which takes place annually from October 1 to 8, is 'HIGH FEST International Theater Festival'. 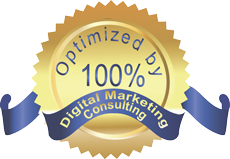 It hosts more than 300 artists from 30 different countries (the USA, the UK, Russia, Spain, Italy, Denmark, Israel, Latvia, Croatia and many others) in the world. In the framework of this festival productions in all genres of performing arts are presented such as theatre (drama, comedy, circus, street performances, mime as well as puppetry performances), dance (modern, folk, classic, etc. ), music (opera, classical, contemporary, jazz, folk, etc. ), etc. The aim of this festival is to create a global culture of collaboration and inspiration. The Armenians are famous for their handicrafts as well. 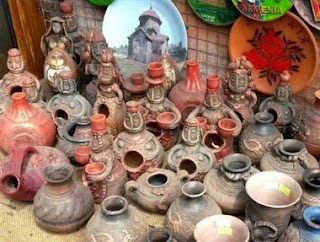 'Arts and Crafts Festival' held in Gyumri, Shirak region, is a great opportunity to admire the works by Armenian handy craftsmen, artists, jewelers, carpet weavers and sculptors. This festival includes various events as well, such as theatre performances, national songs and dances, interesting games, etc. The guests are also treated to national dishes. The Armenians have their unique national clothing known as Armenian garb (taraz). Apart from being a dress, it signifies much more. By the color and from of taraz it was possible to guess whether the person was married or not and even how many children he/she had. The essential part of women's taraz was the apron on the corners of which a life tree was growing which expressed the idea of couple's prosperity. At the 'Armenian National Cloths Festival (Taraz)' one has the opportunity to see colorful garbs, to learn about the meanings of the colours as well as to enjoy Armenian national music, dances and different performances including puppet performances. 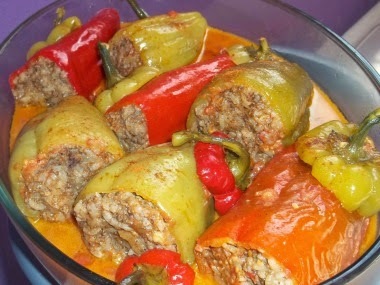 Those who like the Armenian cuisine can enjoy delicious dishes during several festivals such as 'Bread in the Mountains', 'Tolma Festival', 'Barbeque Festival'. During these festivals individual cooks as well as representatives of different restaurants represent old and new, known and unknown Armenian dishes in separate booths. You will have the opportunity to taste the Armenian traditional dishes as well as to take their recipes. So after taking part in abovementioned festivals one will surely get the picture of the Armenian rich culture and unique traditions.